Caviar, an expensive delicacy that is known worldwide, is made by sieving and salting large fish roe. This dish has a grainy texture and it is usually served as an appetizer, garnish or spread. It is extremely perishable and must be refrigerated at once after getting the eggs from the fish. The caviar, according to those who have tasted it, has the consistency of butter that melts in your mouth and leaves a taste of fresh ocean. Exceedingly rare. Exquisitely rich. 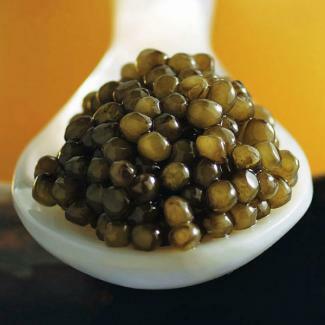 Once in a very great while, as they grade each harvest of caviar, our experts come across a few small batches that are truly awe-inspiring-larger, glossier, more richly colored eggs simply bursting with full, magnificent flavor. These we christen Anastasia Special Reserve the pinnacle of caviar artistry. This smooth and buttery caviar reveals a complex array of briny notes, gloriously imparting the flavor of the sea. Delectably fresh and fruity, Ossetra ranges in color from light brown to dark brown, its firm grain is pleasing and juicy, with a distinctive nutty taste that inspires fierce loyalties. These farm-raised, bright, golden-brown beads burst with a flavor that's all its own, milder and slightly sweeter than its Caspian cousin - truly an exceptional experience for the fortunate few. Extremely limited quantities. have the strongest flavor of all sturgeon eggs. They are the most highly appreciated among connoisseurs, for their taste. These medium-sized glistening grains with their melt-in-your-mouth silkiness come to us from Siberian sturgeon, farm-raised in Florida under conditions identical to their native waters. 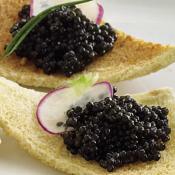 The sustainable Royal Siberian caviar is sure to become your velvety favorite. Unlike wild-harvested caviar, Anastasia Gold Caviar is produced on a Florida fish farm under exacting, controlled conditions.